Good news! The A5 leaflet with full details of the new weekly schedule of Pilates classes has been printed. Why not pick one up the next time you come to class. Fridge magnets and drawing pins available on request for those who want to stick the timetable somewhere prominent around the house or office. With a wider selection of morning, lunchtime, evening and weekend sessions to choose from, it will be even easier to find a Pilates class to suit a busy lifestyle. Every class is suitable for all ages, abilities and fitness levels. For those wanting to explore the repertoire of Pilates exercises more fully, we’ve purchased some foam rollers and Therabands. Similar to the small balls we already use, the rollers and bands allow us to challenge our stability as we perform an exercise, and help us to isolate or engage targeted muscles more effectively. We’ll start to use the rollers and bands in class from Monday 5th September. Regular visitors to the EP website will remember this post from January with details of a retreat I’m going to be teaching at on the Greek island of Skyros. The time for this is fast approaching; I can’t believe how quickly it’s come around! I’ll be working abroad from Saturday 10th to Monday 26th September inclusive. Obviously I won’t be able to teach my usual timetable of classes in Clevedon and Bristol during this period. Apologies for any inconvenience. It’s a great opportunity though for me to learn and grow as a teacher and bring back to class lots of new ideas, skills and experiences. 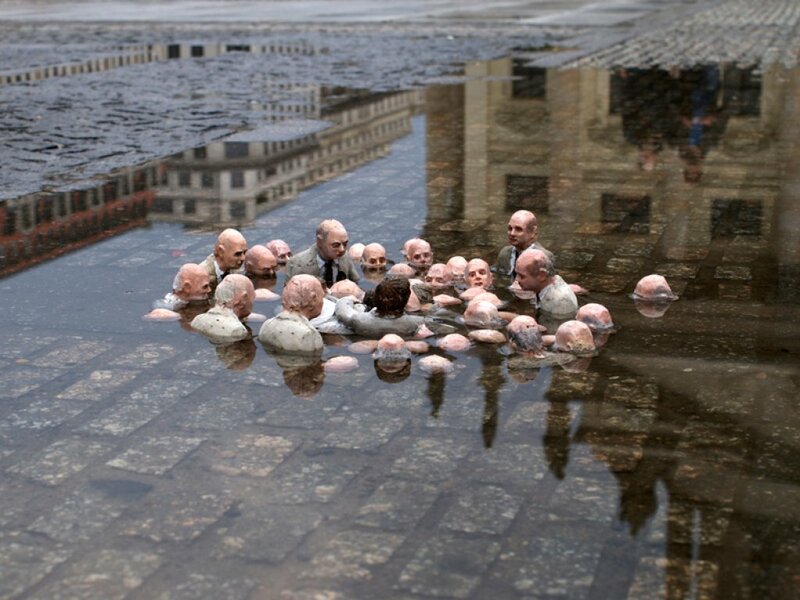 I hope you will return to class after this short interlude. Just so we’re clear, the last class before I head to Greece will be on Friday 9th September at 09.30 and the first class back after my time abroad is Tuesday 27th September at 18.15. Finally, look out for Embody Pilates in the local press in late September/early October. 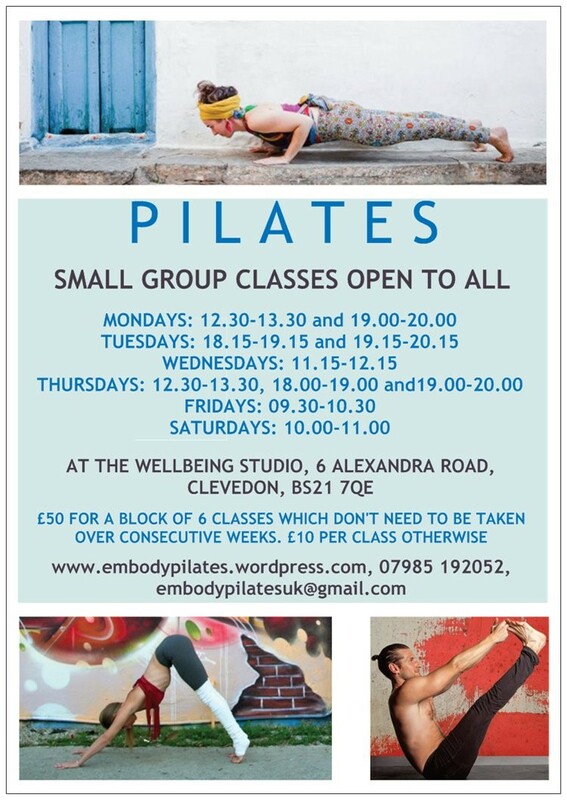 We’ve managed to secure editorial space in three free monthly glossies – the Clevedon and Tickenham Green Paper, Clevedon Living and the Clevedon and Portishead Resident – to promote the new class timetable and to spread the word about the huge benefits that regular Pilates can bring. New research into stretching suggests that doing Pilates regularly can lower blood sugar levels, increase heart rate and burn calories – all major health benefits of course. The BBC programme, Trust Me, I’m A Doctor teamed up with Dr Ian Lahart of Wolverhampton University to explore the impact of passive stretching (where a person is stretched by someone else) on health. This experiment was a follow-up to research studies in the US and Korea looking at the benefits of passive stretching on diabetes sufferers. 10 volunteers were tested on two separate days. On each day they came in having not eaten overnight, and drank a sugary drink whilst their blood sugar levels were monitored. 20 minutes after drinking the drink, they either sat still (day one) or they were gently stretched for approximately 20 minutes (day two). On the stretching day, the participants were carefully stretched 10 times. Each stretch (six lower body and four upper body stretches) lasted 30 seconds. Each 30 second stretch was repeated twice with 10-15 seconds in between each repetition and 15 seconds between each stretch. Participants’ blood sugar levels were measured three times: once straight before the sitting or stretching period, once straight after the 20 minutes of sitting or stretching and then finally, 20 minutes after that. Straight after the stretch, the volunteers’ energy expenditure in calories, along with their heart rate were also measured. When the volunteers weren’t being stretched, a sugary drink raised their blood sugar levels as you would expect. But when their muscles were gently stretched after having the same drink, their blood sugar levels actually FELL and by 16%, making them 23% lower than the peak their blood sugar reached when they just sat still. The volunteers’ heart rates were on average 17% higher with stretching compared to when they just sat still, going from an average of 67 beats per minute to an average of 78 beats per minute. This increase is in line with what you would expect during low (mild) intensity aerobic exercise; the effort required was similar to taking a stroll. The heart rate reflects the effort expended. The participants burned 126% more calories per hour as they were being stretched compared to when they were just sitting still. That’s nearly 100 (98.3) calories extra per hour without doing any exercise themselves. Dr Lahart said that if you were to stretch yourself rather than being passively stretched you would expect an even bigger impact on blood sugar levels, heart rate and energy expenditure than was seen in the study. This is because you’re manoeuvring yourself into those stretching positions and you’re applying more tension in the muscles. Based on this, we can conclude that the stretching achieved during the course of an hour-long Pilates session can significantly lower blood sugar levels, increase the heart rate and burn an impressive number of calories than you might expect from a low intensity form of aerobic exercise. A mini adventure to this year’s Edinburgh Fringe Festival means there will be no 10.00 Saturday morning Pilates class on the 20th August at The Wellbeing Studio. I won’t be running the 11.30 Piloga class at Strode Leisure Centre either, however a cover teacher has been arranged and a yoga class will run in its place. There also won’t be a Monday lunchtime class on the 29th August as this is a Bank Holiday. Apologies for any inconvenience caused by these minor changes. For clients who normally come along to the Monday and Saturday classes, why not join one of the other sessions taking place those weeks. You’d be very welcome. Last week I road-tested the Healthy Back Bag (HBB). I saw a brand new one up for auction on eBay, liked the look of it more than anything, wanted an alternative to my usual messenger bag or rucksack go-to options, and managed to get it for a fraction of the normal price. As bags go it’s quite impressive. The well thought-through, ergonomic design makes it surprisingly comfortable. 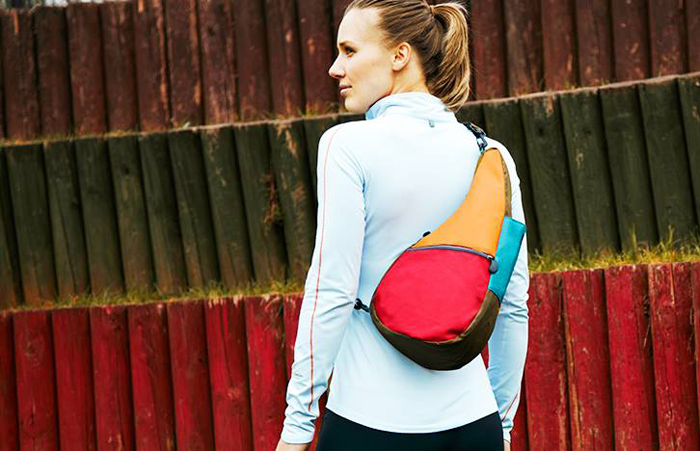 Essentially it’s the single strap alternative to a back pack; a rucksack that behaves like a messenger bag. The HBB was developed by a chiropractor in collaboration with a leather craftsman and a doctor. They wanted to address the weight stress issues associated with carrying a single strap bag. There is a genuine medical rational behind the distinctive teardrop shape of the HBB: the more places a bag touches the body when it is worn, the lighter it feels and then less it affects the posture adversely. The teardrop shape distributes weight across the back, hugging the back rather than pulling away from a point on the shoulder. This is what causes the characteristic hunched-up shoulder or crooked neck and spine you see when someone is carrying a conventional bag. Do this for any length of time and it starts to feel quite painful. There are no rigid bits in or around The Healthy Back Bag either. It moulds to the shape of the body, which, combined with a non-slip strap, ensures the bag both contours the back and stays on the shoulder, however you wear it. I’ve been wearing it across the body, messenger-style which seems to distribute the weight of the bag better than just hanging it off one shoulder. The inside of the HBB is just as intelligently designed as the outside. Unlike a rucksack, you can get into the bag easily without having to take it off. There is a two-way zip running along the length of the main compartment, which faces inwards. Convenient then as well as secure. 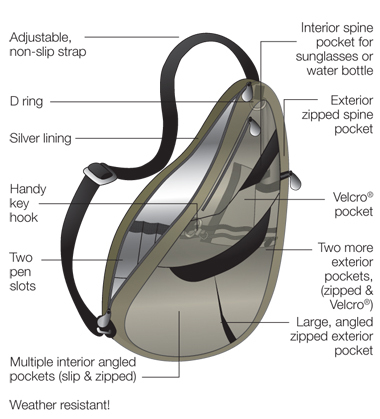 Inside there are numerous pockets which help distribute the weight of your belongings evenly around the bag. The Healthy Back Bag comes in five different sizes. Advice – go with one that is proportionate to your size, i.e. the length of your trunk, and small enough to discourage you from carrying around lots of things you don’t really need. Obviously the less stuff you carry with you, the less stress there will be on your body. To get hold of a Healthy Back Bag you can buy online directly from HBB. Alternatively, try eBay where there are usually quite a few available to bid on or purchase via the buy it now option. If you’d prefer to see one in the flesh first, use the HBB website store locator to find the nearest shop to you. For those based in Clevedon, the nearest retailer is Shuropody at Cadbury Garden Centre, Congresbury. To finish, here’s a favourite ‘back’ song. Looking at the posture of Gillian Welch, David Rawlings and Chris Thile, I’d say an ergonomically designed guitar is long overdue!